The Royal Mint has launched a new series of special sovereign coins that pay tribute to Britain’s longest-living and longest-serving monarch, Queen Elizabeth II. 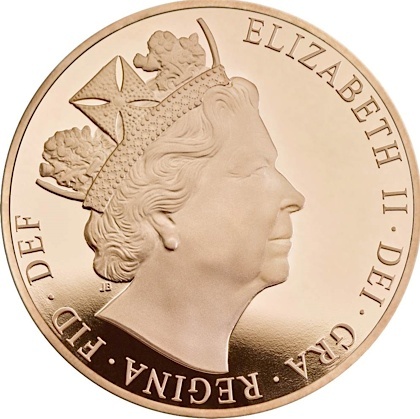 As Her Majesty celebrates her 90th birthday on April 21, 2016, the gold sovereign line of coins for next year will bear the special portrait that first appeared in celebration of the day she became the country’s longest reigning monarch. The commemorative portrait debuted in September, appearing on a variety of celebratory coins issued in time for the day on which the Queen surpassed the long-standing reign of her great-great-grandmother, Queen Victoria, who reigned a total of 63 years and 216 days. The celebration was somber and low-key as requested by the Queen, and she went on with her daily activities and duties after the ceremony. 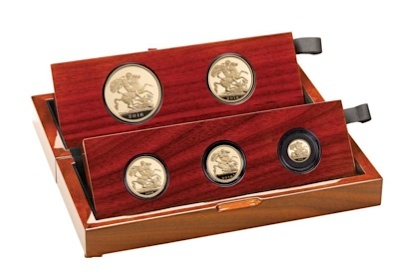 The sovereign line of Proof coins consists of the recently added ¼ sovereign, the ½ sovereign, and the denomination’s most popular piece, the single sovereign. A double sovereign and £5 gold piece are also available with the new portrait, designed by James Butler MBE RA. 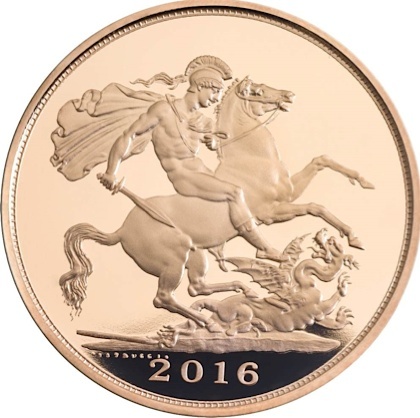 The reverse retains the iconic image of St. George slaying the dragon, rendered by famed engraver and artist Benedetto Pistrucci. His familiar and exquisite design has been used intermittently since its original introduction in 1817, and by almost every monarch since. This combination of the Butler portrait and Pistrucci’s reverse is issued only for 2016. 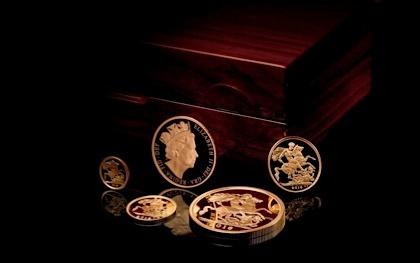 The £5 gold piece is available individually and as part of a five-coin set; the three-coin set consists of the double sovereign, the sovereign, and 1/2 sovereign. The sovereign and the 1/4 sovereign pieces are also available separately. Each piece is presented in a custom-polished wooden case, with a certificate of authenticity. The two BU pieces are available separately and presented in a custom case, with a certificate of authenticity. For more information on these and other coins offered by the Royal Mint, please visit their Web site. Information is offered in English, with international orders dispatched where applicable.